This is Baku Tsuri Bar Hunter. It’s for the Nintendo 3DS, and it looks wonderfully peculiar. In English, the title means “Burst of Laughter Fishing Bar Hunter.” If the fishing reel peripheral that encases the Nintendo 3DS wasn’t self-explanatory enough, this is a fishing game. But here’s the catch: You are fishing for barcodes—not, you know, bars to drink at. This is an AR kiddy game, based on a manga debuting this spring, and the trailer below shows how it works. You scan in barcodes, which are then turned into in-game sea creatures. 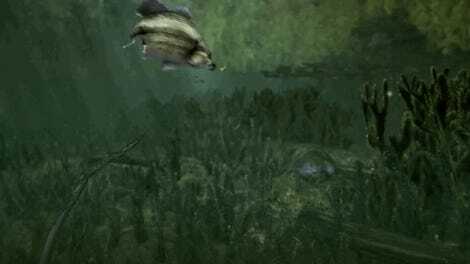 Then, using 3DS motion controls, you fish. No idea if the actual game is going to be as good as this proof of concept ad, but when I showed it to my two youngest kids here in Japan, they were extremely interested. I am, too.